Do you consider yourself to be the ultimate Badminton fan? If so, then you never want to miss a single match and the free Badminton Tournament Schedule can help you do it. 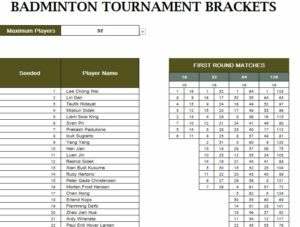 This free template is a simple and organized document that you can customize to enter the dates of each Badminton match quickly and easily on your computer. You can use this document over and over again. Customization is as simple as clicking a cell and writing the information you need. If you’re ready to get started building your own Badminton Tournament Schedule this year, then follow the directions below. To download your free Badminton Schedule, scroll to the bottom of this page and follow the link provided for you. Now, in the Setup tab, you will see two tables and a box that lets you know how to use the template. This will help you structure your schedule. Start by entering the number of players, total, within the tournament you want to follow. You will then proceed to the seeded and player name columns in the first table of this page. Simply enter their seeded rank and their name alongside it. The next step is to simply do what you love, watch the games. Use the next table to enter the individual scores of the players and the outcome of the matches. All the data and information that you enter into this template will appear in the corresponding tab that’s labeled with the same number of maximum players you entered in the first step. For example, if you selected 128 players, all your information will appear in the “128 Players” tab in the form of a useful bracket. This template is the easiest and best way to stay up-to-date with your Badminton Tournament.